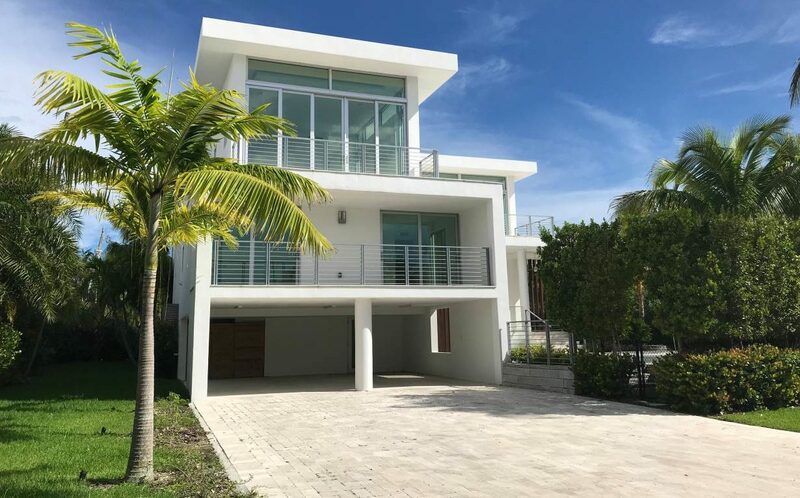 An example of a new home in Key Biscayne, which has been raised to avoid growing flooding risk on the barrier island near Miami. KEY BISCAYNE, Fla. – “Rain is bad for us. Rain is very bad for us,” Elena Errazuriz sighed as she looked out through the bay windows of her Key Biscayne home. It was the Friday before Memorial Day, and Errazuriz was annoyed. Ahead of the start of hurricane season – which runs from June to November – Subtropical Storm Alberto was pounding the Miami area with heavy rain and strong winds. “Rain triggers thoughts of flooding,” Errazuriz said. Errazuriz, a writer from Spain who has lived in Florida for nine years, had spent nearly three months trying to sell her four-bedroom-house on Key Biscayne. She was surprised at the small number of visitors and the low offers. Some viewers even implied that the house had little value as its elevation is among the lowest in all of Miami-Dade county: just 3.2 feet above sea level, Errazuriz said. “I was afraid I’d have to sell for just the land value,” she said. Key Biscayne, a barrier island just south of Miami Beach, is among Florida’s most valuable real estate. However, fears over rising sea levels mean homes at lower elevations are selling for less than expected, and their value is increasing more slowly than those on higher ground, according to data from a Harvard University study published in April. The findings show that home buyers and investors are taking sea-level rise and other climate-related risks into account when making offers, said study author Jesse Keenan, a professor with Harvard’s Graduate School of Design. “Nuisance flooding has increased a lot annually and people in these vulnerable areas are becoming much more aware of the risks,” Keenan said, referring to problems such as high-tide flooding that can close roads or overwhelm drainage systems. “People who are buying property in places like Key Biscayne also tend to be more aware of the effects of climate change and sea-level rise,” he told the Thomson Reuters Foundation. The researchers assessed data for about 108,000 single-family homes using information from the Miami-Dade County Property Appraiser’s Office. Those included property type, lot and building size, property and building values, year built, market and property tax assessment values and the last three transactions. They also factored in elevation data sourced from the U.S. Geological Survey. The findings chime with a preliminary report issued last month by the county property appraiser’s office. It showed property values fell in Key Biscayne, and in other low-elevation, waterfront luxury real estate areas in Miami. In Key Biscayne, one of the wealthiest municipalities in the county, the estimated taxable value of properties dropped 1.8 percent compared with last year. In contrast, the taxable value of properties across the county climbed 3.9 percent, with values in the highest elevation areas of Miami-Dade county rising still more. Hialeah, a lower income, working-class neighborhood about 12 miles from South Beach, saw taxable property values rise 7.2 percent. Elevation there is 6.4 feet. Property appraiser Pedro Garcia said his office could not conclude that lower values were related to fears about sea-level rise, and suggested the cause was likely a boom in apartment complexes being built in luxury neighborhoods. In Miami Beach, which is considered ground zero in the battle between development and climate change adaptation measures, housing demand remains high, with estimated home values up 3.1 percent this year. The city is investing $500 million to raise streets and install 80 new pumps to push floodwaters out of the narrow barrier island. Real estate agents said they didn’t believe climate change risks were making home buyers more selective when looking for properties in vulnerable areas. They said the increase in the number of condominiums along the shoreline was inflating the inventory of properties available, and that demand for property even in flood-prone areas such as Key Biscayne was stronger than ever. Christopher Zoller, a veteran realtor and former chair of the Miami Association of Realtors, told local media that concerns about sea-level rise were not stopping buyers. He said consumers in general were not yet that worried, and noted that home values in some luxury areas with very little elevation – such as Gables Estates – were still rising. Other realtors, though, said they had noticed what had happened to home values in Key Biscayne. Juan de la Puerta, who sought buyers for Errazuriz’s house, said the difference in the value of homes on higher-ground streets versus those lower down was growing starker. “Buyers want homes that have been elevated, or new construction, or homes on the highest-elevation streets in the area,” he said. “They are concerned about flooding and the threat of rising seas, but they are willing to pay the price to live in an exclusive neighborhood like Key Biscayne,” de la Puerta told the Thomson Reuters Foundation. That price, he noted, includes higher insurance costs as well as possible costs not covered by insurance. He said Errazuriz’s house was on a street considered to be one of the worst in the area in terms of elevation, even if the property itself was in excellent shape. The Harvard study showed that Key Biscayne had the highest correlation between property value and elevation of all the municipalities in the Miami-Dade area. That may in part be the result of Hurricane Irma, which last year flooded a large swath of the island, heightening the aversion to low-elevation streets. Errazuriz’s 2,000-square-foot home was severely damaged by storm surge waters and had to be renovated. “We really wanted to deal with any mold damage right away because that could turn into a huge issue,” she said. In mid-June, Errazuriz received an offer on her home, and was hoping to close the sale in a few weeks. But from the original asking price of $1.8 million, the house was contracted for $1.5 million – about 15 percent less. “We could probably have waited for a better offer, but we just wanted to sell before the next hurricane season,” she said. Thomson Reuters Foundation is the charitable arm of Thomson Reuters, which includes the Reuters news service. The foundation covers humanitarian news, climate change, resilience, women’s rights, trafficking and property rights.